Panna cotta literally means cooked heavy cream. The main ingredients are cream sugar and gelatin, some recipes also include egg whites. This dessert is originally from Northern Italy in the region of Piedmont (Piemonte), were back in the days people boiled the fish bones and getting collagen out of this process that was used as the first gelatin. Since I’m still fell inspired from the almondtree in flowering I’m making more almond milk and flavor the panna cotta that I want to serve for my dinner guest this evening. To accompany this panna cotta I’m making a fruit compote made with oranges from the tree and uva passa from this summers grape harvest. 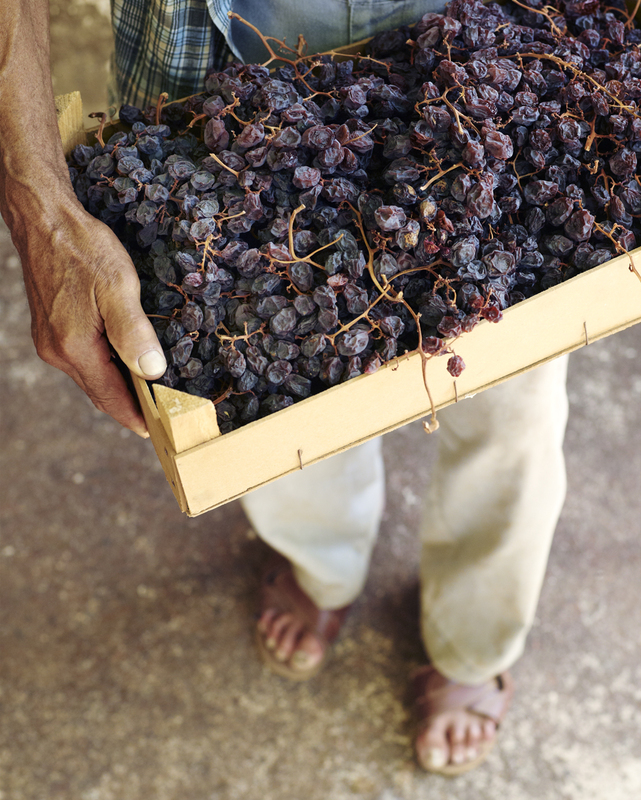 Uva passa is the sun dried Zibbio grape, that you make the Passito di Pantelleria sweet wine of. This beautiful dried grape is a regular sweet here in Pantelleria and is used as a raisin in cooking and baking . To be honest it’s actually the best bloody raisin I ever tasted… sun kissed sweet…. perfumed with a taste of nature from the volcanic soil of Pantelleria. If you can’t get hold of these uva passa you can exchange the uva passa to other raisins or for example use dried plums or just ad more orange or other sweet citrus fruits. Wish you all a great weekend. Place gelatin sheets in a bowl and cover complete with cold water for 5-10 min minutes. Over medium size flame, in a sauce pan combine the cream, almond milk and sugar and heat until the sugar is dissolved. Lift the gelatin sheets from the water and stir into the hot cream until dissolved as well. Oil 6 ramekins or small coffee cups. Divide the panna cotta mixture evenly among each ramekin, set on a level shelf in the fridge,cover with plastic and let set for at least 3 hours. Peel the oranges by cutting the skin off using a sharp kitchen knife. Cut the oranges into medium sized chunks. Deseed the uva passa. In a small but heavy sauce pan, pour the Passito di Pantelleria wine and sugar to boil. The sugar should dissolve and the liquid must reduce to half (on my gas stow this takes about 5 min). Stir constantly all the way to the bottom of the pan when it is boiling, so as to avoid burning the sugar. Add the fruit and set a side until serving. Run a sharp knife around the edges and flip on to serving plates. Spoon up the compote cooled to room temperature around the panna cotta. 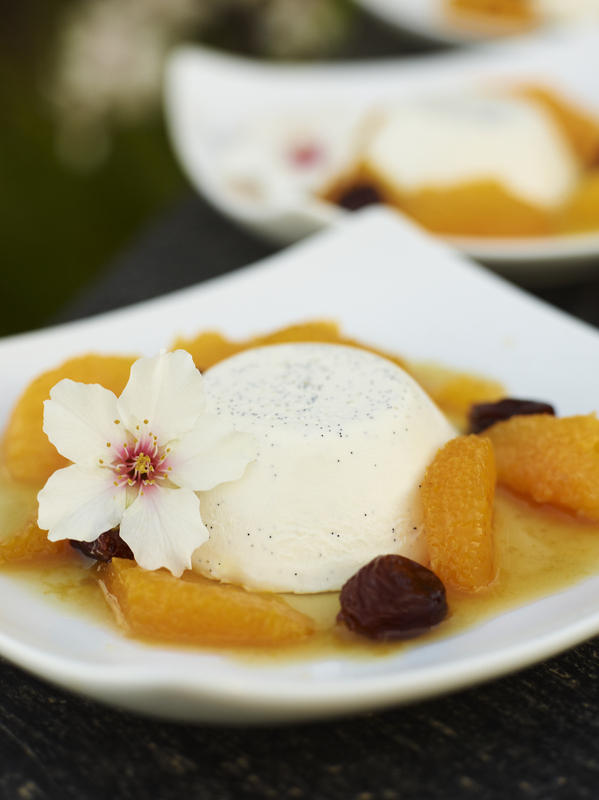 This entry was posted in Dessert Recipes, Pantelleria and tagged almond pannacotta, almonds, Anna Huerta, annahuerta, dessert, dolce, http://www.annahuerta.com/, orange, pannacotta, Under the Almond Tree on February 15, 2013 by Anna Huerta. Mmmmm va gott det ser ut. Det här måste jag prova! Hoppas jag hittar mandelmjölk. Jag förmodar att man kan byta uva passa mot stora gula russin, även om det inte riktigt blir samma sak. Almond trees in full bloom.Om du inte får tag på Passito kan du byta ut det mot Marsala, Port eller annat sött vin. Lycka till!